This double USB socket allows for two devices to be charged simultaneously while also displaying the batteries output. The total output 4.2A load is split 2.1A per side as needed. 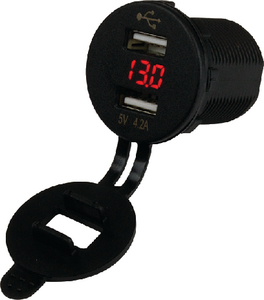 Enough amperage to charge iPhones, iPads, and almost all other devices. Also fits Sea-Dog® power socket shell 426100. Input 12-24V. Output DC 5V/4.2A. Red LED display. IP65 rating. Injection molded nylon.